In 2006 we successfully hosted two meetings, the 23rd annual Midcontinent Paleobotanical Colloquium (March 10-12) and the Advances in Paleobotany Conference (March 12-15). Here is the group photo for the Advances in Paleobotany meeting. Click on the image to view an enlarged version. Ed. : Jarzen, David M.; Manchester, Steven R.; Retallack, Gregory J.; Jarzen, Susan A. 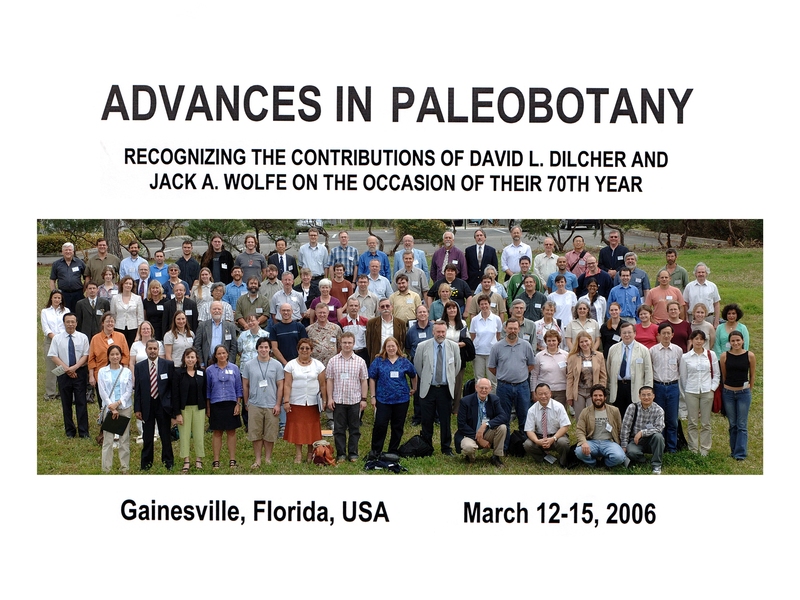 The sixteen peer-reviewed contributions of this volume were presented at a 3-day symposium at the Florida Museum of Natural History, Gainesville in 2006 and honour two landmark contributors to North American angiosperm paleobotany born in the morning of July 10, 1936: David L. Dilcher and Jack Wolfe. Two introductory papers review the works of David L. Dilcher and Jack Wolfe, along with bibliographies of their research publications. The second part consists of selected peer-reviewed research papers highlighting recent advances in Cretaceous and Cenozoic paleobotany and the paleobotanical inferences of past vegetation and climate. In the 1970s Dilcher, Wolfe, Hickey, and others called attention to the lack of rigor in the identification of angiosperm leaves by traditional approaches. They appealed for more critical comparative analyses of extant leaves with efforts to determine diagnostic features suitable to distinguish taxonomic groups. To this end, Wolfe began assembling a collection of cleared angiosperm leaves that could be examined by transmitted light to reveal venation patterns comparable to those preserved in fossil leaves, ultimately the world’s largest collection of cleared leaves, now housed in the Department of Paleobiology at the Smithsonian Institution. A landmark paper (Wolfe & Hickey, 1975), documented the distribution of leaf characters in relation to the Cronquist and Takhtajan systems of angiosperm classification. Here, James Doyle reexamines their approach, updating this seminal work with current concepts of angiosperm phylogeny derived from molecular data. At the same time, David Dilcher was emphasizing the importance of leaf epidermal characters as revealed by cuticular analyses of fossil and extant leaves. Characteristics of stomatal complexes, trichomes, and other epidermal structures could be used to confirm or refute identifications based only on leaf form and venation. Thousands of prepared slides of macerations of fossil and extant leaf cuticles were made in assemblyline fashion for many years in the Dilcher lab, providing steady work for undergraduate and graduate students and resulting in the largest North American reference collection of epidermal anatomy. In this volume, Barclay et al. review the importance of cuticles for taxonomic and paleoenvironmental investigations, and introduce a new web-accessible database of images of specimens from the Dilcher cuticle collections. Jack Wolfe was among the first paleobotanists to accept the concept of a bolide impact as the defining event of the Cretaceous-Tertiary boundary. Wolfe and Upchurch (1986, 1987) focused their attention on paleobotanical change across the Cretaceous-Tertiary boundary and the floristic consequences of this event. Upchurch, Lomax and Beerling provide a synthesis of the research that has been done since then, dealing with the responses of plants to the Cretaceous-Tertiary boundary event and questions about the nature and rapidity of climatic change. Although much of the work on Late Cretaceous floras over the years has focused on North America, Sun et al. here present an overview of Late Cretaceous plant megafossil assemblages from Northeastern China and an interpretation of their paleoenvironmental signficance. Pigg and DeVore compare and contrast the research programs of David Dilcher, who grew up in the Midwestern United States, and Jack Wolfe, who grew up in the Pacific Northwest, with special attention to research on Eocene floras. Dilcher and Wolfe both recognized the relationships between fossil plants and paleoclimate, although they had different views about how best to interpret the data. In successive articles Greenwood and Spicer review the development and recent advances in the methodology used to infer climate from fossil angiosperm leaves. Jack Wolfe was also interested in tectonic uplift and the application of fossil plants in determining paleoaltitude. At the time of his death he was active in a project investigating the timing of uplift of the Sierra Nevada Mountains. In this volume, Cecil, Chase & Wolfe examine the sedimentological settings associated with floras such as Chalk Bluffs and LaPorte in California, providing evidence of considerable relief in the Northern Sierra Nevada Mountains at Eocene times. This challenges the view that the Eocene Sierra Nevada landscape was characterized by low elevation, low relief features formed by broad, low-gradient river systems prior to Neogene uplift. The succession of floras in Pacific northwestern North America provides excellent opportunity to examine floristic and climatic change through time. Wolfe devoted much interest to the assessment of vegetational and climatic change from these floras, and was quick to place the floras in a temporal framework based on biostratigraphic correlation and radiometric dates on adjacent volcanic units. In this volume, Leopold, Reinink-Smith and Liu provide an overview and update on many of the Alaskan Tertiary floras studied previously by Wolfe. The paper by Schorn, Myers, and Erwin provides an updated chronology of mid-latitude Neogene floras of the western United States. The interdisciplinary nature of these studies is exemplified by the approach of Grawe-DeSantis and MacFadden, who apply morphological and isotopic investigations of tapirs to the interpretation of vegetational change from the Early Eocene to the Recent. Christophel and Gordon investigate leaf litter across elevational gradients in modern tropical rainforest vegetation of Queensland, Australia, to provide insights into taphonomic biases that must be taken into consideration when inferring climatic signal from the foliar physiognomy of fossil leaf assemblages. Grote provides an overview of the paleobotanical literature on the Cenozoic of Thailand and describes a newly discovered Pleistocene fruit and seed assemblage from northeastern Thailand. The concluding article (Wagner, Visscher, Kürschner, and Dilcher) demonstrates a tight correlation between stomatal density and CO2 in an extant species of Osmunda,based on cuticular analyses of subfossil leaf material from young peat deposits in Florida. They use the inverse correlation between stomatal index and historical CO2 levels to develop a model with which to infer paleo-CO2 levels from leaves of this fern genus over much longer periods of geologic time.